This popular song laments the fate of Isabella of Austria, Queen of Denmark (1501-1526). A daughter of Philip I of Spain and Joanna of Castile, she spent her childhood in the Netherlands under the tutelage of the regent of the Netherlands, Margaret of Austria. In 1514, at the age of 13, she was married to Christian II of Denmark and became Queen Consort of Denmark and Norway. In 1523, Christian was deposed and had to leave Denmark. Isabella fled with him and their children to the Netherlands, where she died in early 1526 at the age of 24. 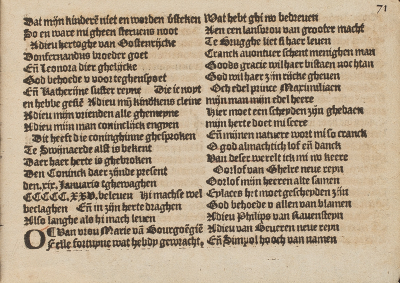 The song text was first published in the Een schoon liedekens Boeck inden welcken ghy in vinden sult, Antwerp 1544. The only known copy of the book has survived in the holdings of the Herzog August Bibliothek Wolfenbüttel. This so-called Antwerp song book was put on the Index Librorum Prohibitorum and so it is probable all the other copies of this edition were destroyed. dat suldi hier na verstaen. oft daer toe gaf den eersten raet. God behoede u voor teghenspoet! Others have just what they want. As you will hear now. My husband, my noble Lord. And those of all my little children. And leave you in sorrow. Or advised that we leave. And live in dire need. The children will prosper here. The word of the Emperor will protect them. May God protect you from adversity! If I had been able to speak with you. Whom I have never [met]. In Zwijnaarde, as is known. As long as he may live. 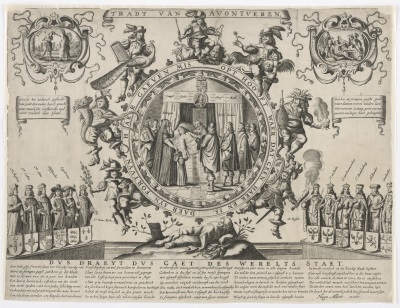 Broadsheet T’Radt Van Avontueren [1660? ], Royal Library Stockholm. 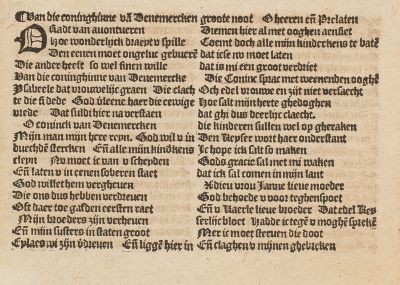 The broadsheet echoes the lament for the Danish Queen Isabella in its title and the popular song will have been familiar to its Dutch readers. The engraving at the centre of the wheel of fortune documents a precarious personal and political situation for the consort of King Karl X Gustaf, Hedwig Eleonora of Holstein-Gottorf (1636-1715). The young Queen is shown already in mourning at her husband’s deathbed in February of 1660. Holding both her hand and the King’s is the small figure of their only child and the heir to the throne, later Karl XI Gustaf, who was only 4 years old at the time. The Queen, now part of the regency, is dependent on her son’s survival for her own future position in Sweden. This version of the broadsheet remains relatively unspecific as to the kind of political turbulence the death of a monarch might cause and what the consequences might be, both in the anonymous verses and in its iconography. The reversal of fortune among kings is highlighted in the Biblical scenes in the vignettes on the top left and right corners of the sheet, showing Samuel anointing Saul and the defeated leader of the Canaanites being maimed by Judah. A variant of the broadsheet held in the British Museum (view here) is both drastically explicit and topical. It replaces the Biblical vignettes with a depiction of the body of Cardinal Mazarin lying in state on the one side and the exhumed bodies of Cromwell and the regicides hanging from the gallows on the other. The verses of the Amsterdam poet Jan Zoet describe in detail the political situation and the reversal of Swedish fortunes in the war against Denmark with the sudden demise of its king. The uncertain future of the Queen and her child is still at the centre of the sheet and forms the focus of the wheel of fortune.